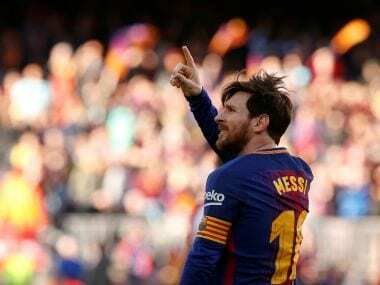 Lionel Messi delivered another masterful performance as Barcelona sailed past Athletic Bilbao 2-0 on Sunday to take an 11-point lead over nearest rivals Atletico Madrid in La Liga. After putting Chelsea to the sword in the Champions League midweek, Messi scored for the sixth game in a row against Athletic at the Camp Nou to propel Barca closer to the domestic title. "Every day he discovers something new, something different, he's very aware of what he has to do, what the team needs from him at each moment," Barca coach Erneste Valverde said of Messi, the Spanish league's leading scorer this season with 25 goals. "Many times it seems that the coach has to teach the players, but what the coach really does is learn alongside them as things go on. We hope to keep on learning together." Not to be outdone by his greatest rival, Cristiano Ronaldo then hit four goals as Real Madrid downed Girona 6-3 to move into third place, albeit still 15 points off Barcelona. A dominant start from Barca yielded the opening goal after just eight minutes as Messi found Jordi Alba out on the left, his pull-back neatly side-footed into the far corner by Paco Alcacer, filling in for the suspended Luis Suarez. The hosts looked a constant threat early on and Philippe Coutinho was denied a second when he rattled the woodwork, while Ousmane Dembele should have done much better with just Kepa Arrizabalaga to beat. But the Athletic goalkeeper was powerless to keep out a crunching low drive from Messi on the half hour, the Argentine taking a touch to control a pass from Dembele before lashing home. Coutinho, the club's record signing, struck the woodwork for a second time as he tried to lob Kepa after latching onto a clever lofted pass from Paulinho, who then smacked a curling shot of his own against the upright. 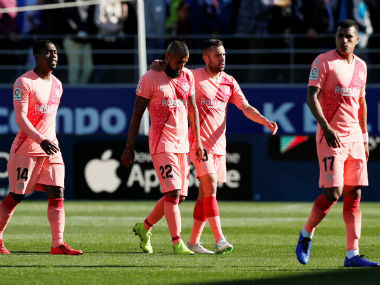 Barca extended their unbeaten La Liga run to 36 matches dating back to last season, drawing to within two games of the record set Real Sociedad between 1979 and 1980. "I would love to (break the record) but why carry on talking about it if we can lose, win or draw the next game," Valverde said. "We're not going to tempt fate. 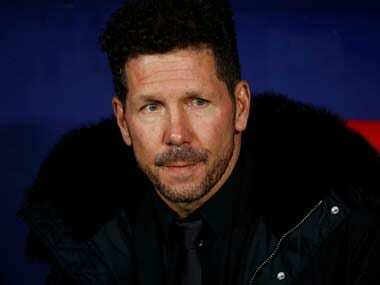 The next match in Seville will be a very difficult trip." Real Madrid reclaimed third place from Valencia when Ronaldo took his La Liga goals tally this season to 22 with four in a 6-3 victory over Girona at the Bernabeu. Ronaldo has now scored 21 goals in all competitions in 13 games since the turn of the year. "I hope that he can catch Messi in La Liga (he is three goals behind), it's important for him and for us," said Real coach Zinedine Zidane. "When Cristiano plays well, the team plays well." The Portuguese star opened the scoring with a deflection after 11 minutes, adding his second off the crossbar three minutes after the break when the two sides had been locked 1-1. Ronaldo teed up Lucas Vazquez on the hour mark before completing his hat-trick four minutes later and adding a fourth in stoppage time. Welsh star Gareth Bale was also on the scoresheet four minutes from time. 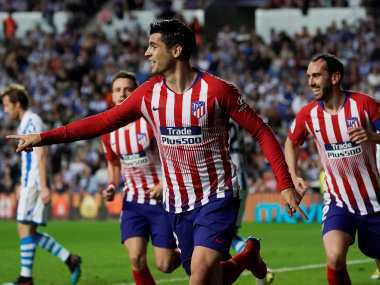 Second-placed Atletico effectively surrendered their hopes of overhauling Barca at the top, as two late goals from 20-year-old Turkey striker Enes Unal handed Villarreal a 2-1 victory over Diego Simeone's side. Antoine Griezmann converted a first-half penalty after he was impeded by Jaume Costa, before Koke hit the post. But Unal headed in an 82nd-minute equaliser for the hosts and turned home a stoppage-time winner as Villarreal climbed up to fifth. Sevilla crashed to a 2-1 league defeat by Leganes just days after pulling off the surprise elimination of Manchester United in the Champions League. The loss means Sevilla are increasingly unlikely to qualify for the Champions League through La Liga this season. Meanwhile, Real Sociedad sacked coach Eusebio Sacristan on Sunday with the team in 15th place with Imanol Alguacil installed until the end of the season.